Distribution: The summer breeding range of Sandhill Cranes is throughout most of Canada, western and central Alaska, and in parts of California, Colorado, Michigan, and the Dakotas. They winter in a few small areas of southern California, throughout south-central Texas and northern Mexico, and in areas along the Gulf Coast. Some Sandhill Cranes are found year-round in Florida and Cuba. Migrating Sandhill Cranes can be seen throughout the United States on their journey between winter and summer grounds. Size: Sandhill Cranes stand a little less than 4 feet tall, have a wingspan of 6-1/2 feet, and weigh 7-1/2 – 10 pounds, with males tending to be larger than females. Diet: Sandhill Cranes eat seeds and grains, invertebrates such as insects and snails, and small vertebrates. Lifespan: These cranes can live for 20 years in the wild. 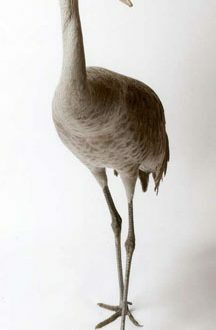 Reproduction: Sandhill Cranes first breed between two and seven years of age (the range reflects differences between subspecies and populations). Both the male and female participate in building a nest over water (occasionally nests are built on dry ground), which can be either floating or attached to vegetation and constructed of vegetation. For 29-32 days, both parents share the incubation responsibilities for the usual clutch of 2 eggs. In years of abundant food, both chicks may survive. However, aggression between siblings often leads to the death of the less dominant chick. Chicks are able to walk, leave the nest, and feed themselves within 24 hours of hatching. First flight occurs at 9-1/2 – 10-1/2 weeks of age. Though the young are able to care for themselves, they usually remain with their parents for 9-10 months, most likely for feeding opportunities and protection from other territorial cranes and predators. During the day, the male and female share incubation responsibilities equally, but at night it is primarily the female that incubates. Sandhill Cranes engage in ‘dancing’ where they flap wings, utter loud calls, bounce, run, leap 6-8 feet, and toss grass or sticks into the air. This is mostly done during courtship but can occur in all ages and in any season. Of the world’s population of Sandhill Cranes, up to 80% stage along the Platte River in Nebraska each March while migrating north, providing one of the greatest wildlife spectacles in North America.